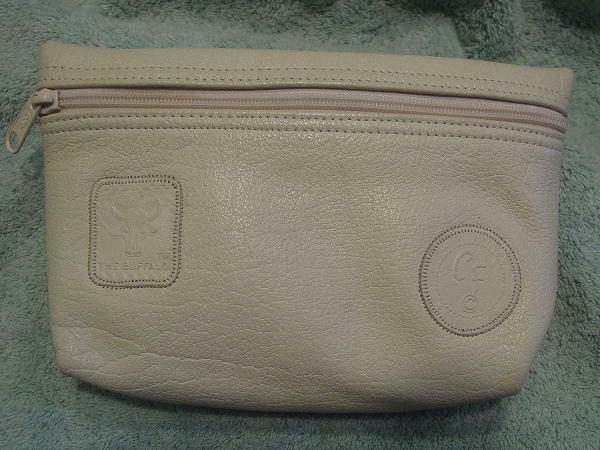 This bone leather makeup bag can also be used as a clutch purse. It is by Carlos Falchi and was made in the USA. It has a side to side upper front zipper opening and two elevated logo design patches (The Buffalo and CF). 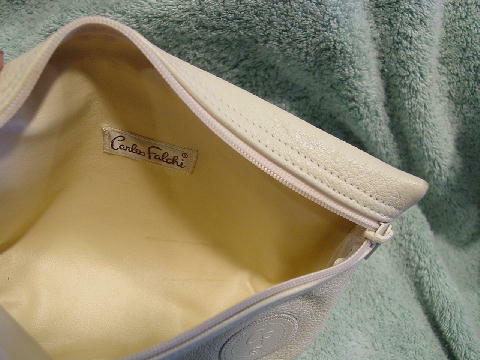 The interior lining is in a creamy-pale maize and has a fabric Carlos Falchi label. There are a few very small light lipstick marks on the bottom and two horizontal dark gray line marks near the bottom. There is a light reddish area on the zipper above The Buffalo patch. The bone color is worn off the two upper corners.